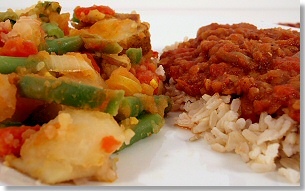 Berber Stew and Ethiopian Green Beans and Potatoes are one of our favor cold weather dinners. However, we always add a can of chickpeas to the stew and replace the white potatoes with sweet potatoes for added nutrition. Absolutely delicious,j quick & easy to make! Word of caution, wear gloves when cutting the pepper! I didn’t and my fingers burned all night. I had exactly a half pound of marvelous green beans in my CSA bag this week and went looking for a new recipe…and this was the one I wanted to try. I’m so glad I did! This recipe is definitely a “keeper” (I made it with the berbere stew, which is also terrific). The lime juice is the extra flavor kick that completes the dish. I used some little white “new” potatoes (whole, with skins) instead of diced potatoes, and I liked the result. Just made this for dinner and my husband and I love it! Thank you! This is one of those wonderful quick, filling and comforting foods you want to eat on a cold winter night. Tastes great and tastes great the next day as leftovers. Our family gave scores out of ten, and the overall total was 46/60. The average score was 8 out of ten, and the verdict was that we would definitely have it again as a main ‘in the week’ dish with the berbere stew. Thanks for putting this recipe online!